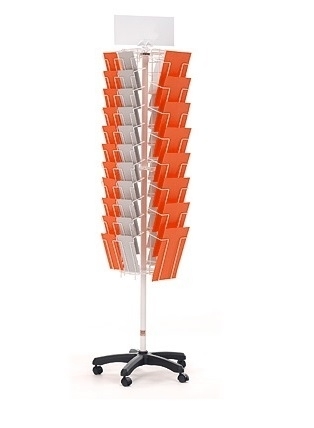 Wire Brochure Holder Rotating Floor Display Stand in an Assembly Kit. Display Kit Comprises of: 3 x Squares, Header, Bearing, Pole and 5 footed Plastic Base. Choose from sides of A4, A5 and DL pockets. Ideal for exhibitions, reception areas, medical centres etc, anywhere to display a variety of leaflets and pamphlets. Order the L-KIT, and order your choice of 4 sides for delivery with the L-KIT. Main picture shows on left the side with 22 pockets for DL, right the side with 8 pockets of A5. Dimensions of this Wire Floor Stand are: (H) 1800mm x (W) 450mm x (D) 450mm. Available in WHITE ONLY.